As you may have gathered at this point, I love history. I can’t get enough of it. 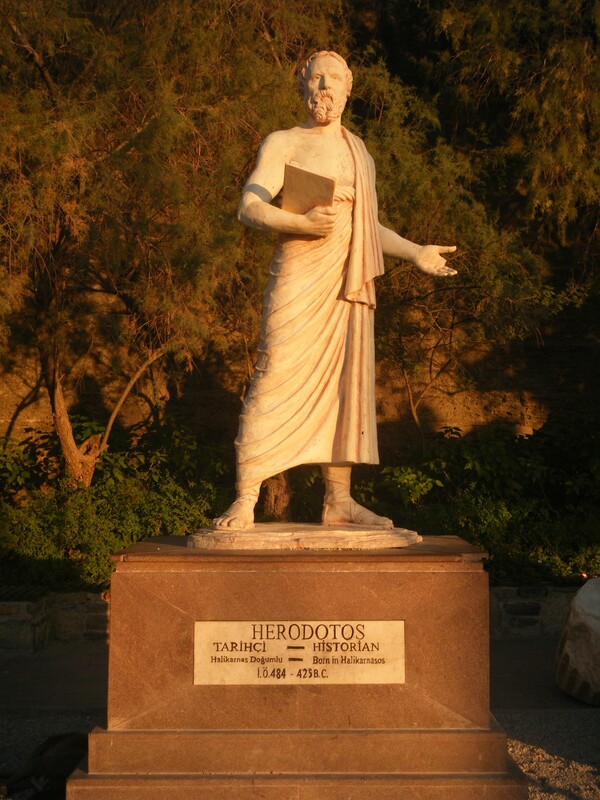 And during our holiday, we visited the hometown of the great Father of History himself: Herodotus. I think I want to adopt him as my personal hero. 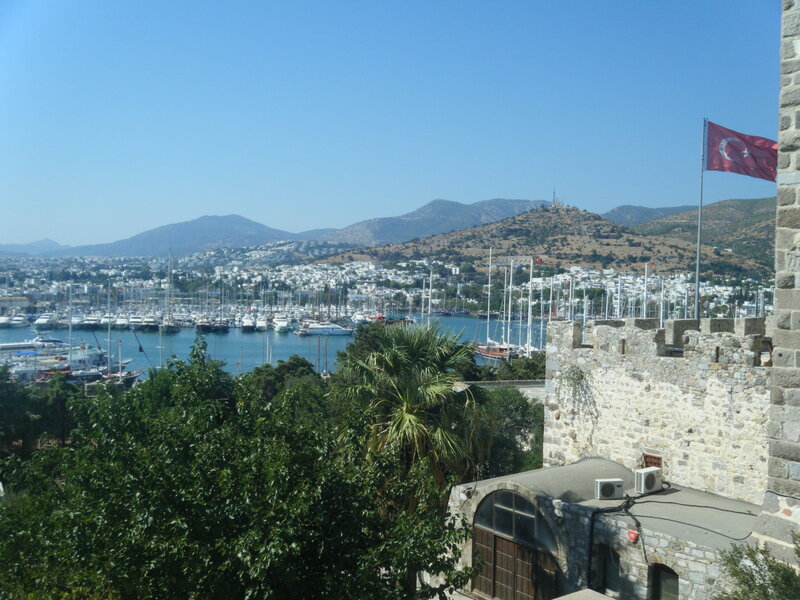 Anyway, one stop on our coolest-ever holiday was Bodrum, formerly known as Halicarnassus, in southern Turkey along the Aegean coast. We took a bus from Kuşadası to Bodrum. It took about two hours, and it was really lovely to have a drive through the mountains. There were so many olive trees everywhere! I love them! There is a myth about the founding of the Greek city of Athens, that illustrates the importance of the olive tree in the life of Mediterranean cultures. In the olden days, Poseidon the sea god and Athena, the patron goddess of civilization, war and wisdom (among other things), were in a bit of a competition with each other over who would be the most favoured god of the Athenians. They each offered the Athenians a gift, and wanted the people to choose which they liked best, and consequently, which god they preferred. Poseidon struck the ground and a spring of running water appeared, but the water was salty and not very useful. Athena, on the other hand, gave the people the olive tree. This was clearly the superior gift, since it would provide wood, oil for cooking and as fuel, and food. It was a pretty good gift, and one that is still giving today! I can’t imagine life without olives! In Turkey, and elsewhere, olive oil is used for every type of cooking, and olives are probably eaten by just about everyone in Turkey on a daily basis. I actually think we consume olive oil in some way or another for every meal of the day! Yum. When you go to the markets or shops here, you also have tons of choice in olives. In America, you can get ‘black’ or ‘green’ olives in a can. They’re okay. But here, you can choose from like twenty varieties, or possibly more! You get to sample them, like you’re choosing a nice bottle of scotch or tasting wine. Some are more tart, or fruity, or salty, or bitter. Ah, so delicious. And good for you. But I digress. So, Bodrum and Herodotus. First of all, Bodrum was gorgeous. It’s a very busy, but very lovely resort town. It was a bit expensive, but we found plenty of cheap and relaxing things to do there. I especially loved sitting at the beachside cafes and bars, drinking a glass of wine while listening to the sea lap up against the pebbly shore. It was so relaxing and the history nerd in my found it really cool to imagine Herodotus growing up in this same town, perhaps sitting on this same beach 2500 years ago, and setting out from this harbour on his amazing world travels! During the course of the year, I’ve twice read his famous book (or I suppose, collection of books)- The Histories. Back in his time, you could get away with such a simple title for your great work, because essentially, it was the first real history book in western civilisation, hence Horodotus’s title: the Father of History! Now, I know what you may be thinking: this history book was written 2500 years ago, by some old Greek guy. It’s probably painfully dull and dry and archaic. That couldn’t be further from the truth. Despite the common (and often faulty) assumption that old things are always boring, this book is quite the page turner. Herodotus travelled all around the Mediterranean world and with his unquenchable curiosity, tried to learn about all the peoples and cultures he encountered, including, but not limited to, various Greek city states and colonies, the Lydians, Egyptians, Babylonians, Massagetae, Ethiopians, Indians, Scythians and their neighbours, Libyans and Thracians, all various peoples that populated Herotodus’s world. He also tells the story of the great war between the Persians and the Greeks, which included the battles of Marathon and Thermopylae, etc. (The film 300 is about part of this war). What makes this book spectacular though, isn’t just the broad and interesting content; it’s also the way he tells his stories. He was a man who truly seemed to respect the cultures and people he wrote about. He tries to give different versions of stories, weigh up the most likely possibilities, and present things for the reader to consider and come to conclusions about. Overall, the book is lacking a sort of biased cultural superiority that you might expect to find in such ancient ethnologies, or even modern ones for that matter. It seems that Herodotus, a Greek man from Ionia, saw value in every culture he researched and you get a sense that he is writing as a cultural equal and not with the condescending ethnocentrism that many people have even now, when they are talking about cultures other than their own. He also actually went to most of the places he wrote about, spending most of his life travelling around the world. I think he must have been an extremely interesting person with so many amazing insights and so much knowledge. If I could choose anyone, living or dead, to have a conversation with, Herodotus would definitely be a top choice. One thing that has been so enjoyable about reading (and re-reading) the Histories is that so much of it takes place in what is now Turkey. There were so many important events and interesting ethnic groups and tribes and kingdoms and empires here, and it really adds a whole new dimension to my understanding of Turkish, Middle Eastern, Western and just overall world history. And this isn’t boring old dry history. It is absolutely full of interesting characters, adventures, dramas, legendary feats, wars and battles. There are brilliant descriptions of beliefs and customs and practices in so many different locations and cultures. He paints the pictures so well that you feel like you’ve visited Egypt or Babylon and seen it all for yourself. You could scarcely find a more interesting, informative or humane travelogue written today! So, I really STRONGLY recommend reading Herodotus’s Histories. It just might change your view of the world and history and life! Last week I devoured this book about spirituality in modern India. It was amazing, eye-opening and beautiful. I highly recommend it as a way to get at least a small glimpse into the complex world that is India, and to get a taste for some very different ways of looking at religion, god, and the meaning of life. The book is in the form of nine short autobiographies, where essentially the writer lets the people tell their own stories, while occasionally asking questions or adding his own bits of background or experience to illuminate parts of the stories. Most of the chapters feature individuals on the fringes of Indian religious culture, either because they are part of non-Hindu religions, i.e. Jainism, Sufi Islam, or Buddhism, or because they participate in practices that challenge or defy the mainstream Hindu culture and live outside of the caste divides or Brahmin interpretation of religion. The thing I love most about this book is its humanity. These personal stories are so real and touching and full of life. I think the author certainly makes an effort to show the ordinariness of these human experiences, which I imagine is a challenge when showing worldviews, practices and beliefs that can be so wildly different from the beliefs and worldviews of most westerners. The first story in the book, about a Jain nun dealing with the death of her best friend, literally brought tears to my eyes, it was so moving and beautiful; uplifting and tragic. And I loved, loved, LOVED the final chapter of the book and the way the whole reading experience was brought to a close, with the life affirming story of a blind minstrel, expressing his love of god through song and fellowship with his fellow minstrels, and singing that the only path to divinity is found within the human heart. After reading that final chapter I felt so happy to be alive! I always find it uplifting, challenging, and inspiring to consider the way other people think and believe. I am ceaselessly amazed by the great diversity of human experience and culture. It is wonderful, awe-inspiring, strange and exciting to be a part of the human race in all its variety. Having started watching the series on malnutrition in the world and its devastating effects on children and their families, I thought this article from the Economist was somewhat related and certainly interesting. Obviously hunger and malnutrition are serious threats to the healthy development of children, but as this article discusses, so are infectious diseases and parasites. The main premise of the article is that in parts of the world where parasites and diseases are most prevalent, many people, on average, have a lower IQ than people who grow up without contracting serious diseases and parasites, such as intestinal worms or malaria. For example, if a child’s body, which is meant to use most of its energy on building up the brain, is forced to use valuable body resources fighting illness, the child’s cognitive development is negatively, and often seriously, effected. Similarly, if a child suffers from intestinal worms, this parasite prevents the child’s body from absorbing valuable nutrients from food, and therefore, brain development suffers. Basically, the point is that there is a vicious circle in some developing countries which lack such things as clean drinking water, adequate heath care, etc, which leads to more childhood disease effecting the development and intelligence of its population, which again, makes the country less able to improve its situation. Eliminating serious diseases in the developing world must be a priority. So, because YouTube is blocked in Turkey, I can’t actually watch the video I posted on my blog yesterday. I’m not certain, but I think I’ve posted a different video than I intended, although that one is just as good. Anyway, here’s the link to the one I thought I was posting, on a government sponsored program in the US works to prevent childhood malnutrition in America, and on the fact that America sends food aid to developing countries in the form of nutritionally-poor grains that would never be given to American children. Important for highlighting the importance of such government ‘welfare’ programs in the US and for showing a major problem in food aid America gives to other countries. Will someone please tell me if I’ve posted the same video twice! I just can’t tell. You can also click here to go to the Starved for Attention website and view all the documentaries. I’m working my way through them now. I also recommend supporting Doctors Without Borders, because I think they are definitely in the responsible-and-effective category in terms of charity organizations.